Press Win+I to visit the Settings app. 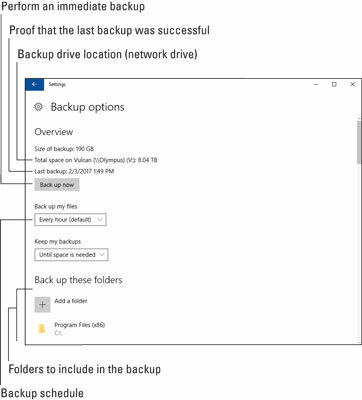 Choose Backup from the list on the left side of the window. You see the Backup Options screen, illustrated here. Below the heading Back Up These Folders (toward the bottom), you see a list of folders monitored for inclusion in the File History feature. Refer to the figure for the specific location. The list of folders is pretty much identical to the folders in your user account (or user profile) folder. These folders hold your programs. Should anything bad happen to the hard drive, you’ll want to restore those programs as well, which is why you need to add them to the list. To add folders to the list, click the Add a Folder button and use the Select Folder dialog box to locate each folder. Open the Drive C icon to find both folders. You can add other folders as well, if you don’t see them in the list. Review the list carefully to ensure that the folders you use are all there; not every folder in your account’s folder is listed. For example, cloud storage folders aren’t listed, which is normal because these folders are backed up on the cloud.